Mother Jones Can You Live Without Money for a Year? By choice, Mark Boyle  basically doesn’t have a cent—or, more accurately, a pence—to his name. Boyle lives in rural England in a trailer he spotted on Freecycle.org . He feeds himself by growing everything from barley to potatoes, foraging wild edibles like berries and nettles, and occasionally dumpster-diving for luxuries like margarine and bread. He cooks with a wood stove fashioned from large restaurant olive cans; brushes his teeth with his own mixture of cuttlefish bones and fennel seed; and makes paper and ink from mushrooms . He barters labor for rent, Internet service, and whatever else he can’t find, grow, or make. This experiment in currency-free living started in 2008 after Boyle, an Irishman who worked in the organic food industry, saw Gandhi and was inspired by the Indian nationalist‘s legendary asceticism. 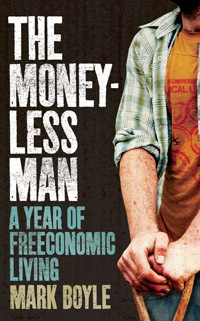 Boyle’s experience became the basis for his book, Moneyless Man: A Year of Freeconomic Living , which has just been released in the states. 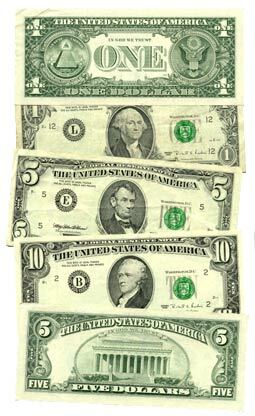 By the end of his year without dough, he’d decided that the life he’d gained by shedding currency was worth continuing. When I recently spoke with Boyle, he was making plans to buy land with the royalties from the book—his only cash transaction in the last two years—to start a moneyless community. He talked about the insights that drove him to make his new lifestyle more permanent. Mother Jones: It seems pretty ironic that you were a student of economics and now you’re moneyless. Mark Boyle: You’re right, it’s a bit ironic. But I think it’s wrong to think of economics as money. The actual word itself actually revolves around meeting one’s needs. Money is one way of meeting our needs, but it’s only one way. I think I couldn’t do what I do today without studying economics, because you need to understand the system first—how it currently works—in order to change it. MJ: Do you ever feel like you should be more engaged in the political process in order to promote sustainability? MB: I feel like what I’m doing is a political process, to be honest. I think every single thing we do is political. Even if you go to the shops and buy a packet of biscuits, then you’re buying into the system, willingly or not. I think we’re conditioned into thinking political systems as being either communism or capitalism. I think there are a lot more options available. We just haven’t explored them. My statement is really a message to the environmental movement more than anything else. MJ: Whom do you think your book will have more of an impact on, serious environmentalists or people who were never interested in ecological issues? MB: I’ve tried to write it in a language that is accessible for more people. When talking to an environmentalist, [I try] to really push the boundaries of that environmentalist. But I also try to communicate with the general public. I think that’s the key—to not use one method of communication for all. MJ: How has living without cash changed the way you interact with the wider community? MB: In current society, your security is cash, and that has huge repercussions. But when you take that out of the equation, you have to have relationships with people and you have to have relationships with the environment to survive. I have more friends than almost ever. We’re convinced we need money to have friends and partners, but actually I’ve found the opposite to be true. MJ: You write that a lot of your interviews are comprised of repetitive questions. So, what is a question that nobody’s asked you? MB: I find that really striking that at the start, nobody was ever really asking me about what it’s like choosing to be a person without a penny in a world that’s striving for more and more. MJ: Well, what is it like? MB: At the start, it was quite difficult. I grew up in Ireland and part of the culture is that you almost fight to be the first person who buys a drink at the bar. It’s quite a giving culture. Going out to a bar and not even being able to buy myself a drink, let alone for my friends—that totally brought up the whole male ego stuff and wanting to be the provider. And then I learned one of the most beautiful ways you can give is giving of yourself and your time. I feel like I’ve worked through a lot of that and it doesn’t bother me anymore. But it definitely wasn’t easy at the beginning. MJ: Can you elaborate more on your concept of not putting more energy into getting food than what you’ll get out of it? MB: It’s kind of compared to a tiger or a lion; if they feel like they’re running after their prey and using too much energy, they won’t do it because there’s no point in expending so much energy to gain less than they’re going to spend. We don’t think in those terms because we’ve got all the fossil fuels and we basically have an insect-free, risk-free energy source. Our food has got way more energy embodied in it than we actually gain from it. But it’s just because we’ve got access to fossil fuel. Once that goes, we’re going to have to go back to a whole different way of growing our food again. MJ: A lot of people’s survival is built into the current system, like urban populations or people who can’t access land. Assuming that a lot of people adopted the money-free lifestyle, wouldn’t everything collapse? MB: This is about transition. We couldn’t move from what we are today to—even in 10 years’ time—living completely moneyless. It’s about moving away from complete dependency on money, which is a very insecure position to be in, anyway. You can’t have all your eggs in one basket. As more and more people move away from one economic model to another economic model, then the market reacts to that in certain ways and people produce less. It’s more about slow evolutionary process than a revolutionary process. And that’s quite key to the whole thing. Our whole agricultural system is based on fossil fuels. Each gallon of fossil fuel is the same as 40 man-hours per week. That’s a lot of extra man hours. And so if we’re going to get back to a way of agriculture that doesn’t involve oil, then people are going to have to transition away from some of the jobs that aren’t necessary. MJ: Tell me about the moneyless community you’ve formed since writing your book. MB: All the proceeds of the book are going into a trust to buy land for the first community and hopefully subsequent communities as well. In a kind of similar way, back in the day, slaves would buy their way out of slavery so the kids could be free. We’re buying pockets of land out of the money economy and then using that land for workshops and courses for free for people who will come along and experience moneyless living and learn all the skills of moneyless living. MJ: How many people intend to live there? MB: We get about 100 emails a week from people wanting to stay. I’m starting with a core group of those people whom I know and whom I’ve built up a relationship with for the last few years. So it’s about 14 who are bringing the project forward. We’re going to build capacity for 20 people and roughly 8 of those people are going to be permanent, and probably another 8 will be kind of transient. We’re trying to build in an entry level for people who want to experience it. So if people aren’t ready to make the whole step, they can come for a weekend or come for a month, or come for two months. MJ: You write that self-discipline is made to liberate and not to constrain the soul. After your experiment, do you still find this to be true? MB: Yeah. I think greatest thing I’ve gained from the last two years has been a massive sense of liberation. There’s a really good quote from Epicurus; he says, “If you want to make Pythocles rich , do not add to his wants but subtract from his desires.” When you reduce what you need in life to the bare minimum, then that’s when you achieve true freedom. It’s kind of like an alcoholic: You have to keep drinking more and more alcohol to sustain a certain level of drunkenness. In a way, I think we’re like that. We’ve never got enough. So the more we consume, the more we want. And the more we want, the more we have to work to pay for all these things and insure them and then get stressed about them and protect them and get bigger houses. I think true freedom comes with letting go of them.